The Cliffs Of Moher are brimming with wildlife, have spurred folktales, and have made cameos in famous films. Wikimedia Commons Looking north along the Cliffs of Moher towards O’Brien’s Tower. The grand and majestic cliffs Of Moher sit above the Atlantic Ocean, stretching along Ireland’s west coast for five miles. At their highest point, which reaches 702 feet, is O’Brien’s Tower, an observational tower built in 1835. 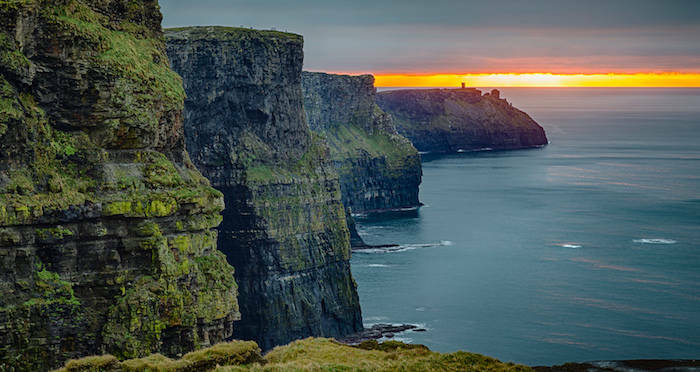 Both the astounding height and views from the top make these cliffs the Emerald Isle’s most visited natural attraction. With a rich history, several accompanying folklore tales, and a few famous pop-culture appearances, it’s no wonder over one million make the trek to visit the famous landmark each year. The Cliffs of Moher are at the southwestern edge of Ireland in the Burren region of County Clare. The rocks that make up the cliffs were formed over 300 million years ago during the Upper Carboniferous period; you can see bands of sandstone, siltstone, and shale in the paving of the cliffs. 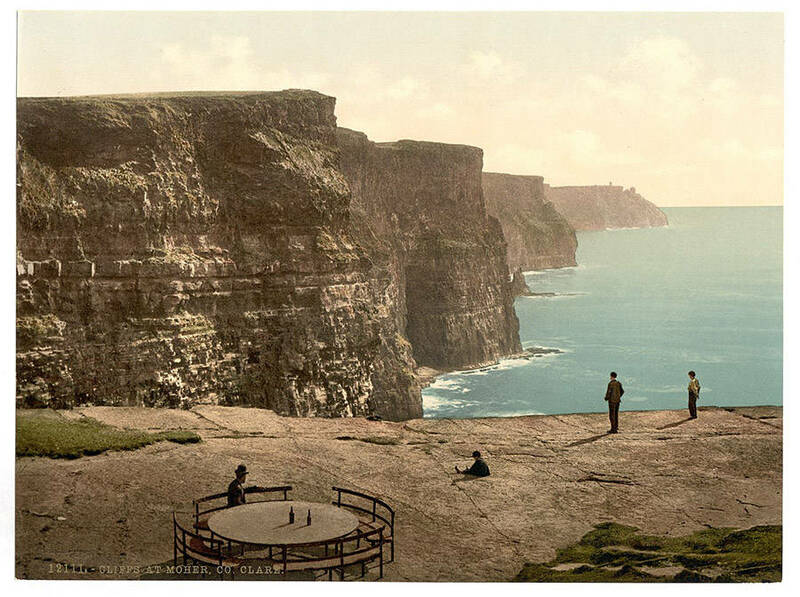 Wikimedia CommonsA 19th-century Photochrom postcard of the cliffs, with Leacmayornagneeve rock in the foreground. About 320 million years ago, when the area was much warmer, heavy rain caused floods that washed sand and mud out to the sea. The sediments were dumped at the mouth or a large river and were compacted into solid rock over time, thus creating the Cliffs that exist today. Rock layers amongst the cliffs vary, as each layer represents a particular event from the life of the ancient river. Local wildlife thrives around the Cliffs of Moher. It’s estimated that 20 species of birds live on the cliffs, including razorbills, puffins, kittiwakes, and even falcons. Below, where the waves crash, it’s common to see dolphins and sharks. The southern-most part of the cliffs is called Hag’s Head, where an old stone ruin called Moher Tower stands. O’Brien’s Tower is more north and from its elevation, you can see the three Aran Islands, the Twelve Bens mountain range, and the narrow piece of land called Loop Head, marked by a prominent lighthouse. The Cliffs of Moher, like many natural wonders, have inspired many legends over time. There’s the Mermaid of Moher, which tells the story of a local fisherman who meets a mermaid with a magic cloak. The mermaid needs the cloak to return to the sea and in an effort to trap her, the man steals it and makes a run for his house. She follows him, but can’t find the cloak and is forced to stay on land. She winds up marrying the fisherman and they have two children together. Years later, while the man is sleeping, the mermaid finds the cloak and returns to the sea, never to be seen again. Then there’s the Corpse Eating Eel. As the legend goes, Irish saint Macreehy killed a giant eel when it ventured into the nearby cemetery to feed on the corpses. When the water is at low tide, two visible stones are said to mark the bed of Macreehy and for generations, a carving of the eel appeared on one of the stones until it slowly eroded away. Finally, there’s the Lost City of Kilstiffen, which is said to have sunk below the water at the foot of the cliffs when the ruler lost the golden key that opened the castle doors to the city. According to legend, the city will remain underwater until the key is found and returned. Some believers say the key is under a gravestone marked with ancient Irish letters on the County Clare mountain called Slieve Callan. Others say the key is in a lake on top of a mountain. In one version of the story, the city rises every seven years and if a person witnesses it, they’ll die before it rises again. Some have even claimed to see the city, shining from below the surface. FlickrTourists looking over the edge. As the cliffs are so inspiring, they have appeared in several movies, including the 1987 film The Princess Bride and 2009’s Harry Potter and the Half-Blood Prince. Due to waves crashing at the foot of the cliffs, the tourist attraction is undergoing coastal erosion, which has caused sections of the upper cliff face to collapse. 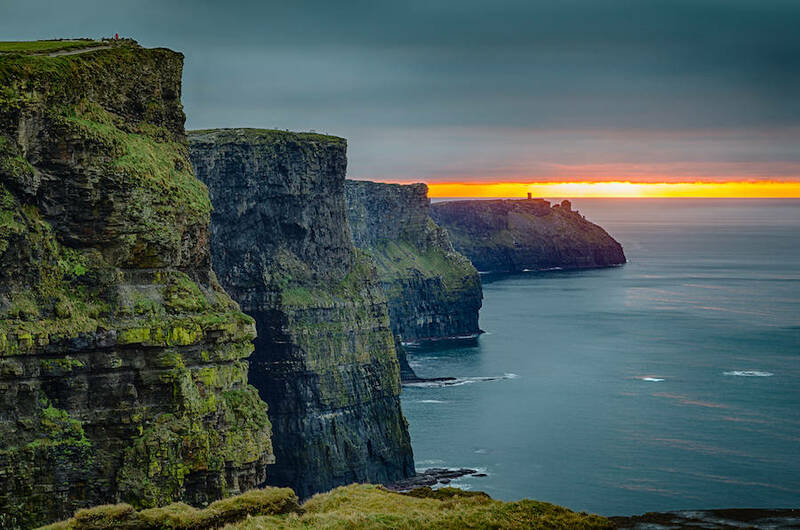 Because of their geological significance, the Cliffs of Moher are officially a United Nations Educational, Scientific, and Cultural Organization (UNESCO) Global Geopark. Therefore, they are managed and protected, as well as used for educational programs and sustainable development. 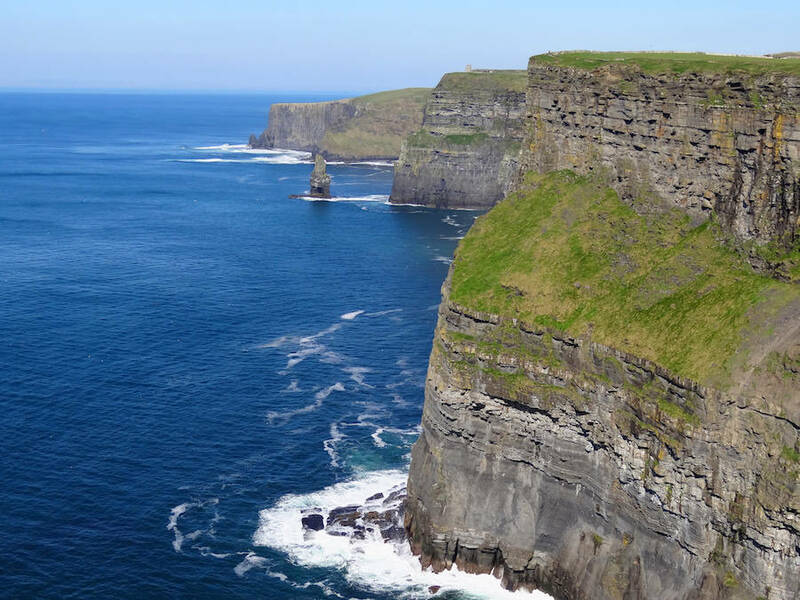 After learning about Ireland’s Cliffs of Moher, check out these 18 European natural wonders. Then read about the the world’s weirdest natural places.